On May 16, 2018, Seagraves High school had the year-end awards. The Awards that were given were for the individual students as well as scholarships to the Seniors that will be graduating next week. There were eleven scholarships that were given out to Seniors, there were two Seagraves Eagle Scholarships given to Mackenzy Ragland and Soli Bueno. The Modell Coats Scholarship was given to Gazman Rodriguez. The Seagraves Chamber of Commerce awarded Jo’van Ochoa their yearly scholarship and Carson Millican was given one from Higginbotham and one from Seminole Riding Club. The Eagle Leadership Scholarship, as well as The Dr. Cauley&Cauley scholarship, was given to Frolian Beltran. Abeni Garcia was the Recipient of two also, the Carolyn Jones and The Seminole Riding Club Scholarship. The last one that was given was the Lowes&Dr. Pepper scholarship to Anthony Conde. Each grade was also given an award for the top 10% from Freshman to the Senior class. In the Freshman class, Lexi Garza is number one followed by Watt Blount, Karina Holguin, and Arlem Mendoza. The Sophmore class also has four with Cade Humphries being number one followed by Rebecca Purcella, Frank Friesen, and J Kinnaird. The Junior class with a top 10 % is Breanna Fleming at number one followed by Abigal Negrete, Cami Harper, and Londyn Hernandez. Last but not least the top 10% in the Senior Class are as follows Carson Millican is number one, Anthony Conde is second and third in the class is Abeni Garcia. 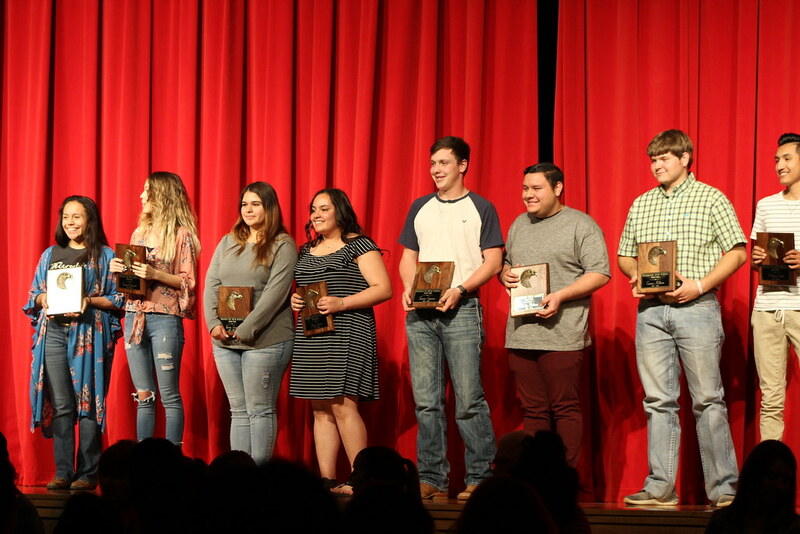 Seagraves High School has a tradition of giving out a Who’s Who Award to the Seniors that have shown leadership and been an all-around student at the school. There are four boys and four girls that were given this award; Frolian Beltran, Anthony Conde, Carson Millican, and Tanner Sessums and the female recipients are Soli Bueno, Abeni, Garcia, Torrie Trevino and Emegail Jacuinde. After all of the awards were complete this year the highest Award given was Mr. and Ms. SHS and the announcement of the Valedictorian and Salutatorian. Your 2018 Valedictorian is Carson Millican, and the Salutatorian is Anthony Conde. Mr. SHS is Davin Rodriguez and Mrs. SHS is Emegail Jacuinde. There were numerous other awards that were given out to students that were recognized academically and also with extra-curricular activities. Congratulations to those who worked hard this year and good luck to the graduating senior class in your future endeavors.